1am - There is a Fairytale going around. This fairytale makes up a story for us to believe, and swallo3w. Hook, line and sinker! This fairytale is portrayed accurately by a video produced by "CNN Money" [There is a link to this video below]. Here's the thing. There has never been even one person, in the entire history of mankind, who could predict the future! Guess about the future? Yes! Pretend they know the future? Yes. Lie to us about the future? Definitely YES! Here is a [LINK] to that video. Note: There are ads before the video. "Rise of the machines" may affect us. The pace of change has been accelerating ever since man walked on Earth. We may deduce from this accelerating pace, that the velocity shall continue accelerating. Robot machines will take over more and more and more of our jobs. When nearly all jobs, even doctors, are taken over by machines, how will that affect you? NOTE: I am breaking off here, to give you a chance to express your opinion about this in comments. Then, I will continue. 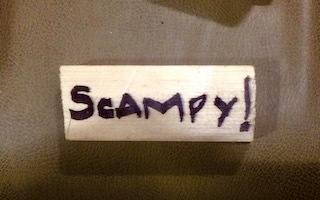 8pm - Scampy Warning Sign! Do you recall the time in last December when I was backing up Little Honda? And forgot that Little Honda was towing Scampy! That lapse of mine, caused Scampy to jack-knife! Lone Wolf RV Park's office entrance. And when I got out of Little Honda, I saw Scampy in tow. I was surprised at seeing Scampy back there! I forgot Scampy a SECOND time!! Wow! Wow! Wow! 9pm - NEVER forget Scampy again! After that second time forgetting Scampy, I became determined to insure that this thing NEVER HAPPENS AGAIN! 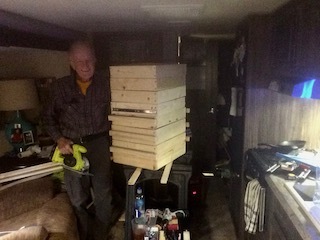 And came up with a solution. It's a Scampy Warning Sign to be on Honda's dash, right in front of me anytime Little Honda is towing Scampy! The sign is on a piece of 3/4" thick lumber. In our lifetime we have seen huge changes brought about because of JFK's declaration to go to the moon. Now it is hard to not see the impact starting with the facti I am keying this comment. Robots do surgery more precisely and eliminated human fraility but don't eliminate humans. For instance a surgeon working with robotic hands could sneeze but the hands won't let any wrong be done. It is all so amazing. I never thought I would see self driving cars. Boy that has made a giant leap. The problem is we still have not figured out to live without war and conflict and I fear we are just developing more efficient ways to end life on earth. Are we smart enough to ethically manage the incredible things our brains create. You appear pretty knowledgeable about the current state of robot machines. How do you believe people will obtain their food, when robot machines are doing most of the work? Where will the money come from to buy that food, when most people are not at a job and earning a living? Wanted to make a quick comment about the US Boarder restrictions put in place that are in the news. From my point of view the root cause is that our folks coming into the country are not checked with with the psycoevaluation techniques use in by the State of Israel. Before you enter Israel, the guard asks some questions to find out about the thinking of the person entering. When you enter the US not much happens except you get your paper worked checked and stamped. If the US would adopt a similiar method as Israel, we would be safer. Wonder why this approach has never been introduced here. George, interested to see you point of view on this. I like how you are interested in the best way to handle border inspection of person entering the USA. Yes, Israeli border inspectors use questions to find out if a person entering Israel could be dangerous. But there's more. Israeli border agents don't have to screen every single person entering Israel. Because selective discrimination is used. That means that a person entering Israel who is 90+ years old, is passed over. Here in the USA, the Liberal community will not tolerate selective discrimination. Liberal feel that it is wrong. As a result, every single person who enters the USA, must remove their shoes for inspection. The ACLU, a Liberal organization, is quick to bring suit against any person, company, governmental agency that uses selective discrimination. In the United States, most persons believe that discrimination in any way is wrong and should not be tolerated. And selective discrimination is even a worse offense. It is a fact that robots and robotics are increasingly replacing low-income and some middle-income jobs. This can be readily observed in the auto industry and other manufacturing areas where robots are utilized in sorting materials and performing repetitive actions. Robots are used at Amazon.com for several shipping and delivery tasks. Fast food restaurants are experimenting with technology to replace workers for ordering and serving food. However, robots cannot perform devoid of human control. Higher paying skilled jobs will be needed and will open up in the newer advanced technological milieu for development and quality-related tasks. The higher paying jobs will be there but will require greater education and skill. Did you view the "CNN Money" video that I Blogged about above? There's a link to that video in today's 1am Blog post. Introducing robots does two things, it increases profits for the boss because it eliminates the need for workers and it reduces or eliminates the need to pay workers because they have been eliminated. This further separates the rich from the poor. People who used to work for a living are now sitting at home while their jobs are being done by robots and as Henry Ford realized, these folks can no longer afford to purchase the goods the robots are producing. A redistribution of wealth would be required, maybe in the form of a guaranteed annual income? Yes! You are absolutely correct in your comment. You show how introducing robots affects a person whose job was displaced by a robot machine/automation. If the time comes when perhaps 50%+ of jobs have gone this route, how shall those displaced persons buy food? Obviously we are predicting the future otherwise we would not be learning, teaching, and using automation i.e. robots. Yes, military already uses drones to target and destroy...man power eliminated to fight. They also use it to search and plan. We citizens are tracked every where we go via our cell phones and satellite from above. These surveillances are used by law enforcement. Everything is going automated from picking crops, slaughter houses, planting, making clothing, making food, taking pictures via drones, cars, airplanes, and much much more. It's mind boggling to know how many jobs were affected by automation. I just had a robot do my cataract surgery on both eyes...yikes!! I am old and maybe a robot will change my diaper and feed me when I am 98 years old when I have no one to do that. I am for robots especially if our young men do not die in hand to hand combat in wars...let the machines fight. Now the new war is cyberwars. Israel changed a code that it was sharing with the US to slow Iran's nuclear development that caused a major leak of secret cyber snooping we had been doing. The leak infected every computer world wide and Russia included is using this to now snoop on and hack into computers emails. Young people are recruited to do nothing by look for cyber snooping in Israel and around the world. I will be dead when the world is fully automated and a select few have moved to Mars or other planets. Earth will be nothing by a wasteland. PS robots can now control other robots. No humans necessary if the self thinking robot is developed if it already hasn't. Of course robots have a life expectancy too..parts wear out but a self thinking robot can fix another robot to make it better or make parts. When robot machines/automation have displaced 55%+ of the jobs, and you are one of the 50%, how shall you pay for your groceries? If a person got pushed out of their job due to robot/automation or due to any reason beyond their control -- or even if a whole industry became mostly automated -- why would a person who formerly worked in that industry just sit around wondering how to pay for groceries? Why wouldn't that person learn a new trade or otherwise seek a new job? Actually, George, I stand with you in opposition to automation in most instances. But I still think my question is valid. George, I would go back to living as before, grow veggies, raise chickens, cows, sheep, rabbits to eat. Make butter, cheese, flour and perhaps I can have a few robots working the vegetable garden and milking cows and churning butter and cleaning my house and myself. I'd sit back an enjoy myself with a robot tending to my needs I.e. a cool drink and snack please and what's for super? Oh, would you repeat that first line you are reading to me or rewind the movie I'm watching or replay the music I'm listening to. Robots go clean up the ocean and environmental stuff and make that hover car go faster and cool it down, etc, etc, etc. Sue and Rita, exactly! I could not have said it better myself. I think we make our future. Folks like Elon Musk shape it. Seen Hidden Figures yet? The movie. Three ladies shaping the future like no one believed. Affordable education is the path, immigration is less desirable for many who will not find jobs already being performed by robots. Read today, self driving SHIPS are the future. OMG!! Your comment brings up some interesting points! Freebird! Let us say that your job was displaced by a robot machines/automation. And you found it pretty much impossible to obtain another job. How would you support yourself? From where would you money come? I don't see any robots in Miss Twayler's wood shop! It's rumored that on her trip from San Diego County to Apple Valley, that MsTwayler ran over a robot that was crossing the highway. It was just about your sign SCAMPY! Funny sign, never mind. George, Trust me. That Scampy sign wil have no meaning in fairly short order. We just don't notice things after a while. Just part of the dash. ndenim, I agree with you. You both may have to Wait and see! Much better and happier, in my opinion, to be a believer than a doubter! I agree with Vera. Thought of that little head taping robot, too! Can't Scampy be seen with at least one of the rear view mirrors?